From King Arthur’s Avalon to Plato’s Atlantis, Jonathan Swift’s Laputa to Pi’s carnivorous Eden, people have long dreamed of magical islands where the miraculous happens and the lost find sanctuary. The Celts of Ireland were no different, and in their tradition, the mythical island was known as Hy-Brasil. Scholars variously claim Breasail was a powerful chieftain or an immortal god. The clan Ui Breasail is known to historians to have inhabited northeastern Ireland. According to legend, the great Iron Age chief, Breasal, mourned his lost daughter who drowned in the river Gaillimh near Galway Bay (just east of where the island of Brasil is often placed on old maps). Others note that Breasal was the name given to the Celtic immortal High King of the World who, according to legend, held court on the island of eternal happiness, Hy Breasal, every seven years; during the interregnum, the island is reported to have descended beneath the waves. 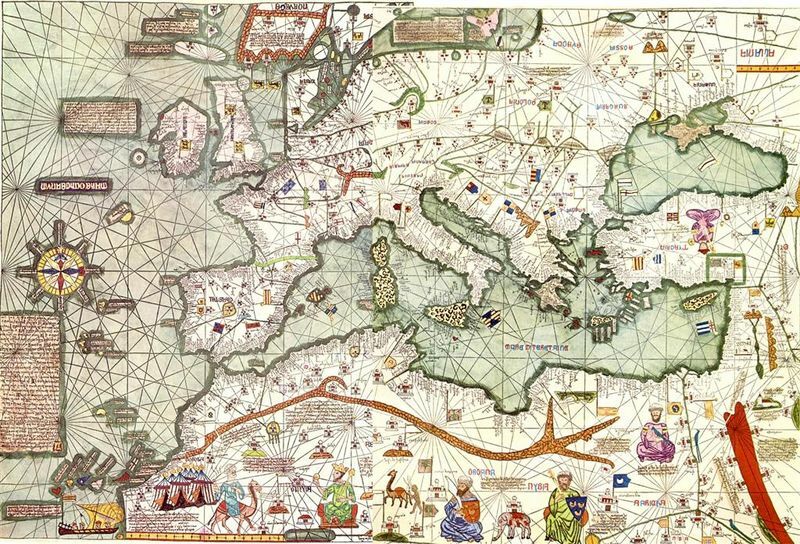 By 1375, the Insula de Brazil was placed at two sites on the Catalan Atlas – one west of Ireland and the other to the south. Yet, by 1480, one of the two islands, both labeled “Illa de brasil,” had shifted to just south of Greenland, while the other remained near Ireland. 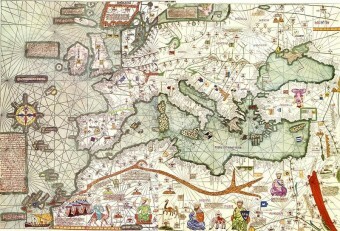 The famous Piri Reis included a round island off the west coast of Ireland in his map of Europe and the Mediterranean in 1513; in addition, two maps from 1595, the Ortelius Map of Europe and the Europa Mercator Map, both continue to situate a round island, named Brazil, to the west of Ireland. Even into the industrial age, Hy-Brasil was included on maps and charts, apparently, and according to some researchers, appeared in 1776 as “a rock 6 degrees west of the southern point of Ireland,” and continued to be recorded as late as 1865 on British Admiralty charts. Regardless of whether anyone had actually visited the island and truly mapped its features, at some point in the 14th or 15th centuries, it was lost again. Since then, others reportedly reached the island. In the 17th century, a man named O’Ley claimed to have been “kidnapped and taken to Hy-Brasil.” At about that time, in 1674, Captain John Nisbet, sailing through a fog bank, reported that a landing party who traversed the island met an old man who gave them gold and silver. A second expedition to the island, led by Captain Alexander Johnson, also claimed to have found Brasil. Some believe Brasil was actually Baffin Island. They support their theory by noting that, through the years, the notably round, bifurcated island in the North Atlantic shifted to the west as maps became more sophisticated. For example, in later charts such as Johannes Ruysch’s 1508 map, the first split island to appear to the west of Ireland sits in the gulf of Greenland. As exploration continued, this island appears to be placed further and further west. Ultimately, they claim, it becomes the mass we know today as Baffin Island. In secondary support for this theory, these historians point to Dalorto’s early works, which place Brasil in the middle of numerous “Fortunate Islands.” Baffin Island is just one of over 90 major islands in the Arctic Archipelago. Another theory is that the island was part of what is now a “sunken land.” Adherents of this hypothesis note that during the last Ice Age (at its peak 20,000 years ago), sea levels were as much as 120 meters lower. Both the Porcupine Bank west of Ireland as well as sunken ridge under the Aran Islands in Galway Bay may have been exposed, and each is in the vicinity of the mythical location of the island. A third theory is that Hy-Brasil never existed. Meteorologists have found that during certain climatic conditions, mirages can appear in northern territories and may occur when “layers of hot and cold air refract, or bend, light rays. Light bounces off the surfaces of clouds, water, and ice to create optical illusions. On July 7, 1878, the inhabitants of the Irish seaside town of Ballycotton in County Cork were both surprised and astounded by the sudden appearance of an island that had not been seen in the ocean before. Sighseers gathering on the strand were able to see the new island quite plainly and were able to make out is coastline, woodlands, fields, and deep valleys. A number of County Cork fishermen set out in boats to investigate but as they approached, the entire island winked out of existence, leaving them amazed and wondering. This is in the general area suspected. Yes in that area is also a old river delta which would of had an abundance of life living there before any great flood would of smothered it. I wonder how low it is today, and what the records say about the pre ice age of this area in question. You can see with google maps where the land once was.